Hi there. Welcome to EFL Func. I am an EFL teacher living and working in Japan. In my spare time I’ve been trying to read through M.A.K. 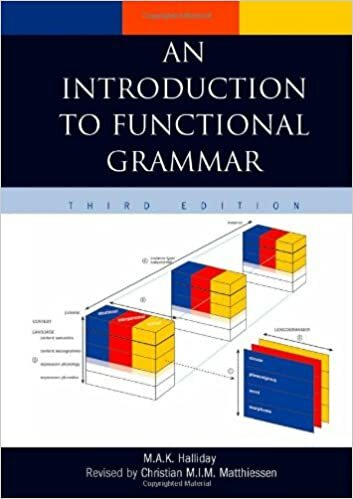 Halliday’s Introduction to Functional Grammar (3rd. Edition) (referred to hereafter as H&M). Functional grammar is more about the ‘actual meaning’ of texts and sees language as systems rather than rules. Please note that I’m pretty much entirely self-taught in SFL so the contents here may or may not be accurate! I’m also putting up some worksheets, materials, and ideas that I’ve tried to use in class. I hope they may be of some help to other teachers who are interested in using SFL in class. Loved reading through your blog. I came across it after searching for ideas on how to talk about ideational metafunction in poetry with 9 year olds. I find SFL to be very helpful in teaching an adult ESL class. However, I struggle with picking out what is relevant for my primary grade students. What age do you teach? Thanks Sharon. I’ve actually been trying to use SFL with all ages – I teach from Yound Learners through to Adults – and to post some activities that I’ve found work up here. Most SFL seems to focus on Academic English or ESL in Australia, which isn’t very relevant for my classes. I’d be interested in how you use SFL in class. Great website. I am currently studying functional grammar and using it in my senior secondary ESL classes with international students. Great website!!! Hi Mister Brett!!! My name is Andoni Oxana.I am from Moldova.I know you have written a corpus study of cup of tea and mug of tea in 2009. Today, I am writing my Master degree paper about containers cup and mug in two languages.I wil write also about concepts tea and coffee from other perspective.I have applied qualitative method.And I compared cup and mug from the semantic part.I found a few information.Thanks to your work I have discovered a lot.And i have proposed to my classes some exercises.I want to thank you. Thank you Andoni. I hope this site is useful.